This is usually the time of year we stop complaining about the snow and cold so we can free up more time to complain about how dirty the snow has gotten and how wet the cold air is feeling. It’s a time-honored tradition passed down through generations of whiney Wisconsinites who were never taught to dress in layers and buy water-proof shoes. For me, this time of year will always conjure up memories of walking home from school. I grew up only four blocks from St. James Elementary on Eau Claire’s west side. 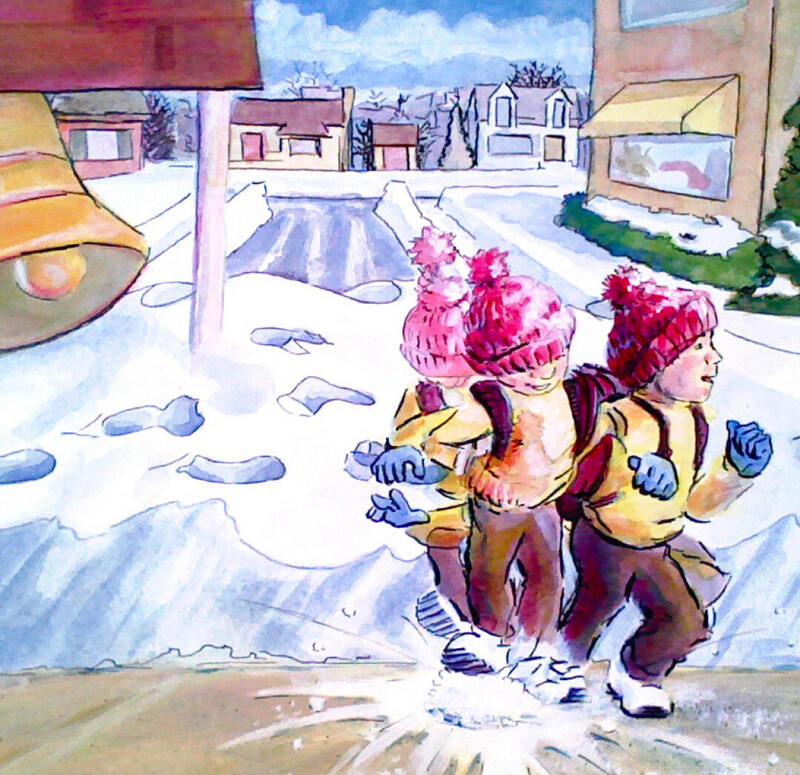 Every day after school, my friends and I would pull on our boots and one-piece snowsuits and head out on foot. We’d all walk home together, over the snowbanks and across the icy streets. I can remember trudging home all winter long, but the late winter walking really stands out. As temperatures drop and fluctuate, basic physics and Mother Nature team up to create some extremely kid-tastic features and formations. The kind of stuff kids like me loved to destroy. For instance, as the snow started to melt and refreeze, a delicate latticework of tiny icicles would form on the ragged face of the snowbanks lining my street. We called it “doozer work” after the translucent structures made by the tiny, green Doozer creatures on Fraggle Rock. (My best friend had HBO.) If you can bring yourself to stop long enough to really notice it, you’ll see something truly complex and beautiful. And fleeting. So of course, we smashed the crap out of it. We kicked it, we punched it, we threw ourselves into the damp, chilly air and body-slammed it. Fragile shards of ice flew everywhere, raining onto the street and tinkling against our snowsuits. I can’t possibly put into words the feeling of satisfaction this produced. It was everything. When doozer work wasn’t available, you could usually find some fragile ice to stomp on. In case you’ve never noticed, all along our sidewalks’ edges, little ice shelves appear in late winter. And honestly, I have no idea how anyone is physically capable of walking by these things without stepping on them – simply for the sheer joy of feeling your body’s weight press down, suddenly crack the ice, and then crush it against the sidewalk – especially that really thin, pale white ice that makes a hollow creaking sound. On very rare and glorious occasions, you might find part – or even all – of an ice shelf that used to cover a puddle. The puddle is gone, but the ice remains, with a good two or three inches of air beneath it. The ice is just sitting there like a precious gift from Old Man Winter himself, who every so often sees fit to reward the children who truly appreciate all his hard work. Ladies and gentlemen, if you are somehow able to walk by such a unique spectacle and not totally go to town on it with many, many triumphant boot stompings and clompings, well ... I now declare that you were never a child. You sprang from the womb as a 30-year-old non-trad business major. My condolences to your poor mother. Scientists should study you in the hopes of finding a cure. No offense. Just go stomp on some ice. If you don’t like it, I’ll understand. I can’t imagine what it’s like to grow up without the snow and the ice and the cold for a good part of the year. As an adult, I guess I can see the appeal of sunny, 78-degree weather all year long, but I feel bad for kids who don’t have the chance to experience a dramatic shift in seasons and landscape. I mean suddenly, like magic, there’s all this stuff to climb on and slide down and build with and throw at your friends’ faces. For free. And no one makes you clean it up. Sadly, even people who do grow up with the Awesome Power of Winter will often take it for granted, because they’re too busy whining about wet socks and having to shovel. Unless you have a chance to just stroll through it everyday, as kids seem less and less likely to do, you’ll never grow to appreciate it. That’s what my walks home from school did for me. I’m so lucky to have had that chance. It was fun. And it still is.